A reader asked whether airplane wings could be modeled in SketchUp. Without ever having tried I confidently answered “anything can be modeled in SketchUp”. I am an instrument rated private pilot and the question intrigued me. I wondered how one might go about modeling a wing. So later that day I set about to develop a proof of concept. The result is shown at right. This proof of concept, or first attempt, has a number of flaws so I decided to take it to another level. 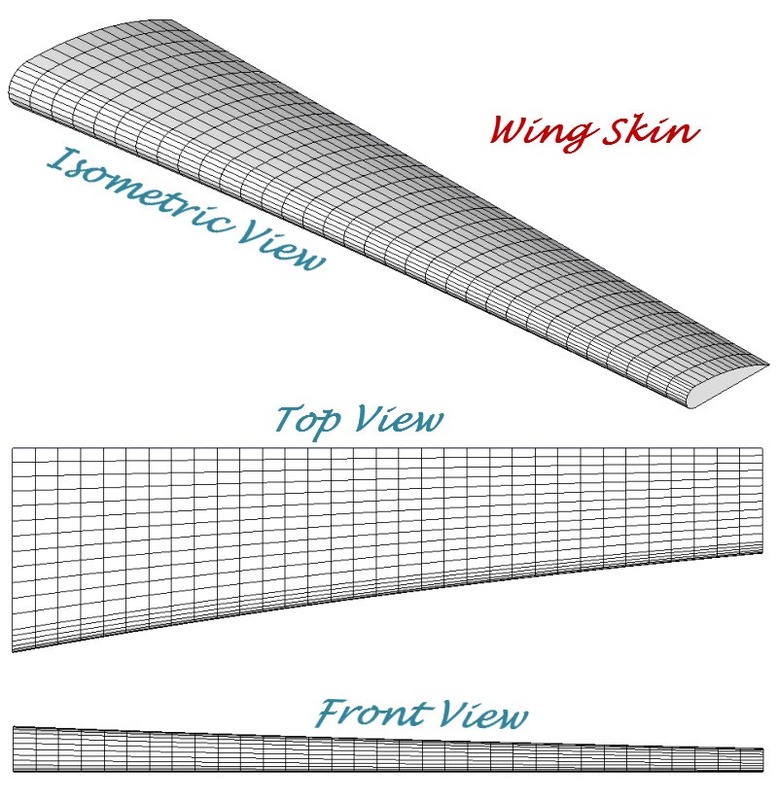 In this article I will describe in layman’s language the major design parameters and trade-offs the aeronautical engineer makes when designing a wing and then I will show you hot to model it. Let me make very clear that I am not an aeronautical engineer; the definitions and explanations I give here are my lay interpretations of things I have read over the years. If you are an aeronautical engineer and take issue with anything I say please correct me by commenting to this post. That way all readers can benefit from your feedback. I have two simple SketchUp models the reader can download for self manipulation. Airfoil – Airfoil is the cross section of the wing sliced by a plane parallel to the plane formed by the plane’s longitudinal and vertical axis. The airfoil generally has a positive camber on the top surface, is thicker near the front edge than back edge and the leading edge is smoothly curved approaching a semi-circle. Control surfaces located at the trailing edge of the wing near the wing tips. Surfaces move in opposite direction (one up and the other down) to produce roll around the longitudinal axis of the airplane. The speed of an aircraft relative to the air surrounding it. The angle between a wing’s chord and the direction of flight (a vector parallel to airspeed). A straight line running from the leading most point on the leading edge to the trailing most point on the trailing edge. Forces opposing the direction of flight. Drag has two components: parasitic drag, caused by skin friction such as ice accumulating on a wing; induced drag, caused by flight attitude such as high angles of attack. Control surfaces located at the trailing edge of the wing near the wing roots. Surfaces are angled down in steps. Each step produces more lift until the increased drag slows the airplane to a stall speed. Mach 1 is the speed of sound; Mach 0.6 is sixty % of the speed of sound and so on. In dry air at 20 °C (68 °F), the speed of sound is 343.2 meters per second (1,126 ft/s). The view of a wing looking down its vertical axis. 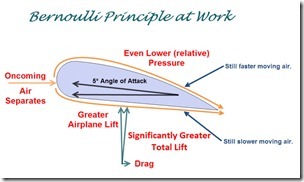 A point reached when the airfoil no longer produces sufficient lift to overcome weight and is produced by angles of attack greater than the stall angle. Stall can be abrupt and dangerous. Essentially the wing stops flying. Wing sweep is usually the counterclockwise rotation of the wing in the planform view. The major advantage is to high performance planes flying near or above Mach 1; wing sweep helps to increase the maximum airspeed of the plane. Taper can be applied to the leading edge, trailing edge or both. Wings are generally tapered such that the chord is shorter at the tip than at the root. Taper should not be confused with Sweep. The major advantages of wing taper are: reduced weight, structural integrity (lower bending moment), reduces drag. A disadvantage of wing taper is that it reduces the AOA at which stall occurs at the tip and hence may have poorer stall characteristics. Generally a wing has lower angle of attack (AOA) at the tip than the root. The AOA usually decreases linearly from root to tip. This type of twist is used to ensure the wing stalls first at the root and last at the tip where the control surfaces are. Wings Setting Angle (also called wing incidence) is the angle between the fuselage center line and the wings chord line mapped on the y-z plane (plane of symmetry). You can think of it as a built in AOA which helps to increase lift at slow speed such as during the take-off roll and climb. Typical wing setting angles are 0° – 5°. You probably remember basic airfoil (hydrofoil in a fluid) theory from your high school physics class. Airfoils and hydrofoils operate on the Bernoulli principle which says that as a fluid increases in velocity it is accompanied with a decrease in pressure. You have seen this in action many times in your daily life. As you drive a pickup the air flows over the top at a speed roughly equal to the speed of the vehicle. The air behind the back window, in the bed of the truck, is still; not moving at all. As a result things sitting in the bed often are lifted up toward the fast moving air overhead. Indeed, the whole backend of the truck experiences some lift and makes the back of the truck a little “lighter” creating problems for the driver in wet or icy conditions. The airfoil takes advantage of this phenomena (or more accurate one of the many laws of physics). You have probably experimented with a sheet of paper as an airfoil. If not, hold a piece of printer paper between the thumb and forefinger of your right and left hand at the end of the paper. Pull on the paper to take out the slack at the end. The rest of the paper will fall limp. Bring the paper to your lips with your lips just above the paper. Now blow steadily and easily. Notice the paper lift slightly. Now blow steadily and harder. Notice the paper lift more. The harder you blow the more the paper lifts. This is the Bernoulli principle at work. Fast moving air on the top side of the paper produces lower air pressure and results in lift being produce in the direction of high pressure (beneath the sheet) to low pressure (above the sheet). The airfoil of an airplane wing (and many bird wings) is wider in the from with the front edge being round or curved, and tapering to a very thin edge at the back. The top surface generally has a camber and the bottom surface is generally flat. See the second image above. Oncoming air is moving at the air speed of the airplane and separated at the leading edge. As air that moves over the top must travel a longer distance to meet up with the air moving beneath the wing, it must must travel at a faster speed than the air on the bottom. Therefore the relative pressure is greater above the wing and hence lift is produced at the bottom of the wing. In the second image above you will notice that while the distance air must travel at the bottom is less than at the top, it is still greater than the straight line distance from leading edge to back edge. Aeronautic engineers often build in a slight angle to the airfoil, called angle of attack. This has the effect of decreasing the distance that must be traveled on the bottom, and hence increases the top edge distance. This means the resulting total lift will be greater. However, if the angle is too large the face of the bottom of the wing will be presented to the oncoming air and produce excessive drag. So there is a delicate balance that must be achieved. See the third images above. Notice that the total lift is still perpendicular to the bottom surface of the plane (oversimplification) and now has components of airplane lift and drag. Airplane lift is opposite the pull of gravity while a small amount of drag tries to slow the plane and is opposite the planes travel. 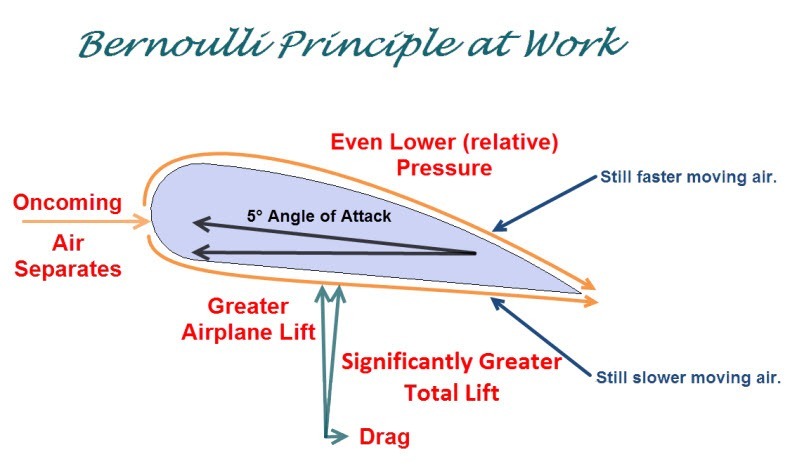 If the angle of attack is optimum there is sufficiently small drag such that the airplane lift is still larger than if there were no angle of attack. This description of lift doesn’t mention downwash at the trailing edge of the wing. This downwash assists in generating lift. Lift is a complex issue when thoroughly treated and has many components. My description is admittedly simple, but still useful for basic understanding. Drawing on my early pilot training on wing design I started with an airfoil profile; essentially the cross section of a wing. Airfoils come in many shapes. In this article I am modeling a basic airfoil which only requires three steps. The picture at left shows the three perimeter portions of the airfoil. I start with a semi-circle to the left of points a and b with a radius of 12” (2 foot diameter). At the bottom of the semi-circle I extend a line 96” (8 feet) from point b to c. From a to c I use the Arc tool with a Bulge of approximately 6 5/64” (a radius of approximately 204 17/32”. The dimensions of this airfoil may not be efficient, indeed may even be a poor design. However, it does have all the characteristics necessary for flight: the front edge is smooth and curved, the trailing edge comes to a point, and the air must travel a greater distance on the top surface than it does on the bottom surface. This is a basic but not atypical airfoil. When completed I make this airfoil a component called Airfoil#0. 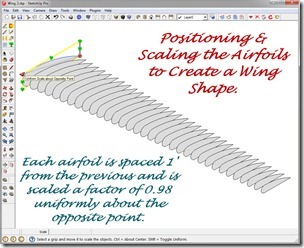 At this point a wing setting angle can be modeled by simply rotating the airfoil around an axis perpendicular to the airfoil surface and running through the tails trailing edge (point) See the third image in this article. General aviation airplanes have wing setting angles of 2° – 4°. Commercial airliners may have wing set between 3° – 5°. Supersonic fighters have very shallow wing set between 0° – 1°. Flying wings are considered to have no set because they have no fuselage. The wing I modeled here has an exaggerated 8° wing set to make it more visually apparent in my images. Wings are often tapered so that they are smaller at the tip than they are at the fuselage. Lift generated at the tips of the wing have much more influence (torque – ft-lbs) on the plane around its longitudinal axis than lift near the fuselage. The ailerons are placed near the tip of the wings and to manage aileron response stability the wing tips are tapered and hence produce less total lift. Creating the wing shape is a series of tedious steps, one which would benefit from a Ruby script, which I might write one day but not for this article. First I need to create a number of airfoils; remember an airfoil is a cross section of a wing. So I need enough cross sections, evenly spaced to give me a smooth wing shape. 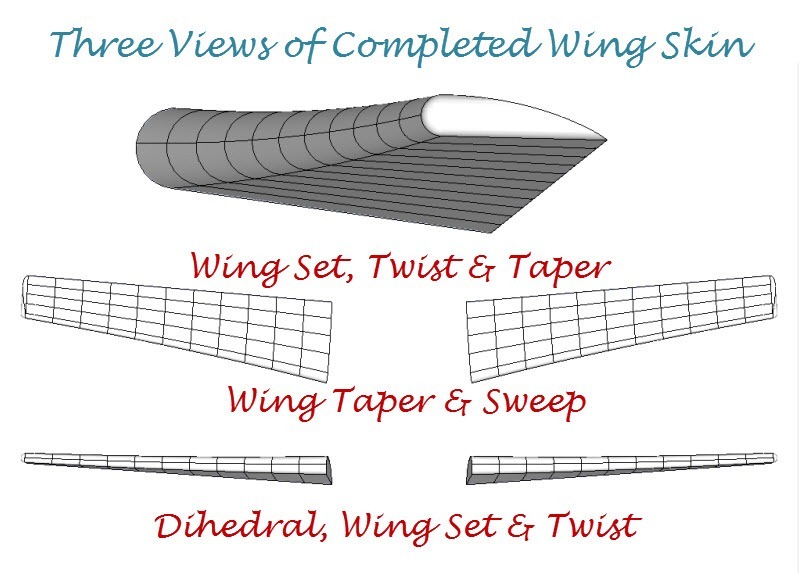 My wing, when finished, will be approximately 35’ in length so I arbitrarily choose to create 33 additional airfoils, spaced 1’ apart, and each one smaller by a factor of 0.98. Also, when done I want the trailing edge to be a straight line. To do this I use a combination of the Move/Copy, Scale and Make Unique tools thirty three times (this is where a Ruby script that recorded a sequence of steps and repeated them N times would help). First I use the Move/Copy tool to copy and move the previous airfoil to the left one foot. Next I use the Scale tool to uniformly scale about the opposite point a factor of 0.98. The “opposite point” is the point at the trailing edge. This will keep the trailing edges lined up along a straight line. Finally I use the Make Unique command on the Context menu to make a new component, each sequentially numbered. 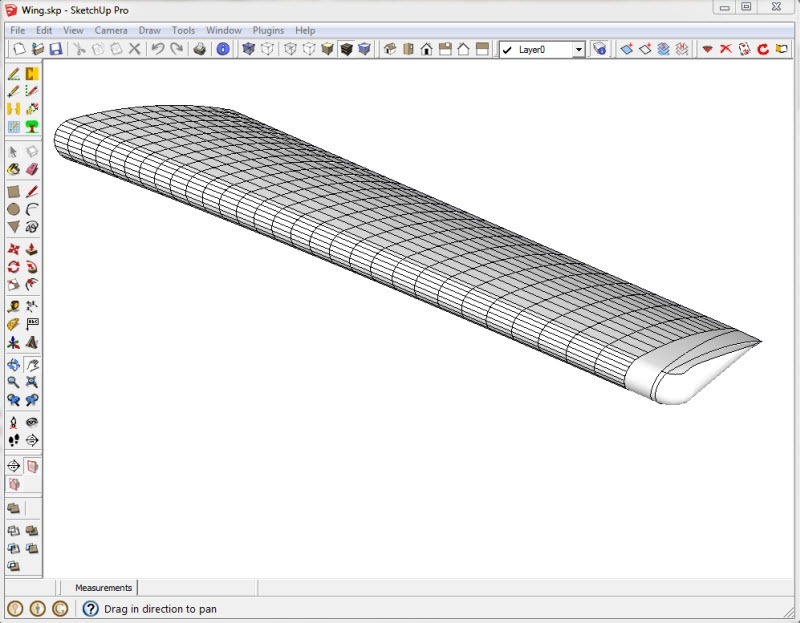 I now have thirty four airfoil components named Airfoil#0 through Airfoil#33. 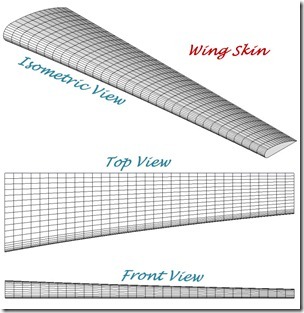 Many wing designs include wing twist; gentle continuous rotation of the wing along it length. The direction of twist has a profound effect on the planes stall characteristics. 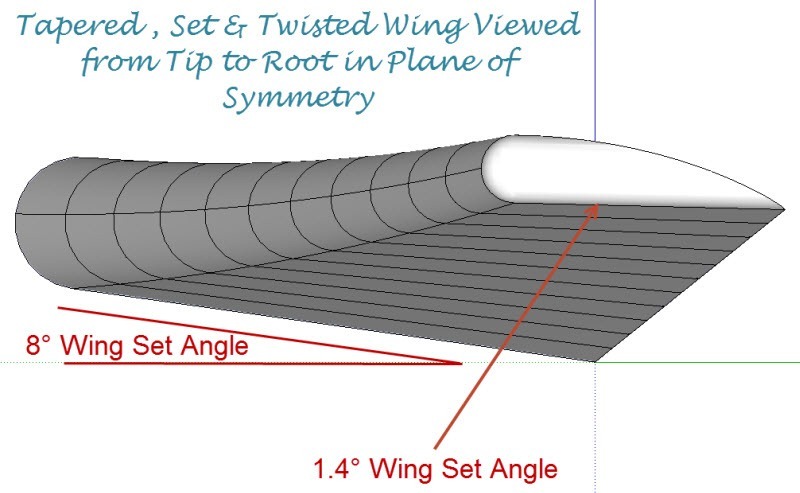 If the wing is twisted counterclockwise, when viewed from the tip and looking at the root, the wing tip will have a lower angle of attack than the wing root. Recall that wings stall – wing stops flying – when the stall angle is reached. Once the wing stops flying the pilot has little or no control of the plane. 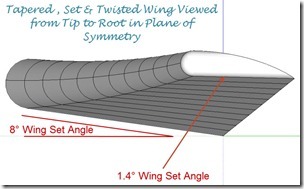 Wings with twist don’t stall at the same time along the wings length, rather the roots stalls first because it has a larger set angle than the twisted wing’s tip. Hence stall progresses from the root outward to the tip as the AOA increases. Ailerons, the roll control surfaces, are located near the tip of the wing. So it is desirable for the tip of the wing to remain flying (not stalled) as long as possible when the planes angle of attack reaches the stall angle. Wing twist assures this occurs. Modeling twist is a simple matter, though a tedious one, of reducing each airfoil’s set angle a fixed amount relative to the previous one starting at the root and working toward the tip. 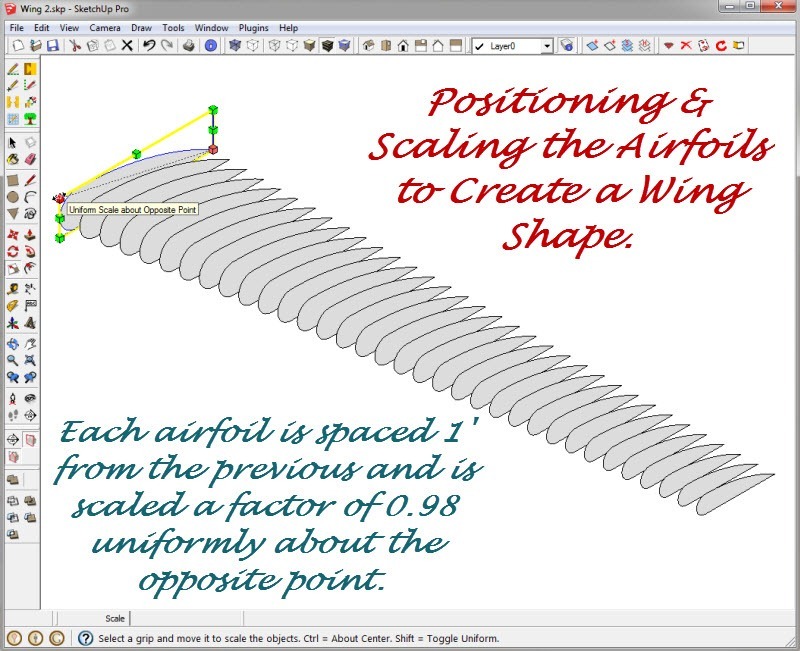 In the case of the wing I modeled here, Airfoil#0 has a set angle of 8°. Each following Airfoil has a set angle reduced from the previous by 0.2° resulting in Airfoil#1 having a set angle of 7.8°, Airfoil#2 7.6°, Airfoil#3 7.4° down to Airfoil#33 1.4°. 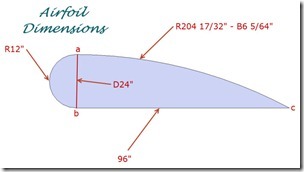 In practice this can be modeled by selecting Airfoils #1 – #33 with the Select tool. Reduce their set angle by 0.2°. While all 33 airfoils are still selected use the Select tool with the Shift key to deselect Airfoil#1 leaving Airfoil#2 through Airfoil#33 still selected. Now use the Rotate tool to reduce the selected airfoils set angle by 0.2°. Now deselect Airfoil#2 leaving Airfoil#3 through Airfoil#33 still selected and reduce their set angle by 0.2°. Repeat this process for each airfoil down to and including Airfoil#33. 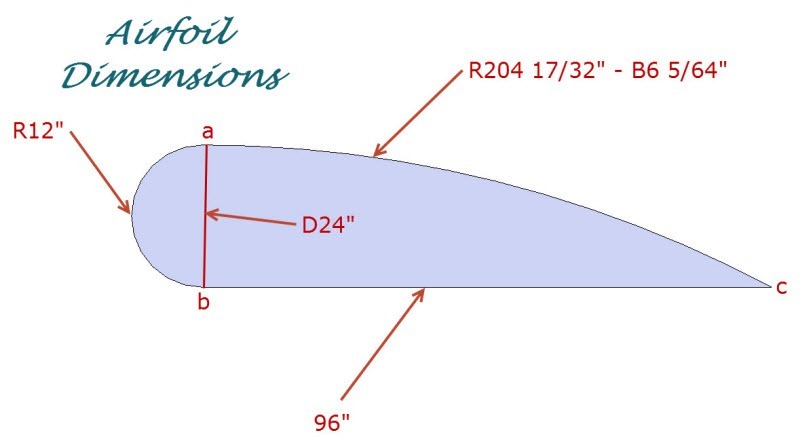 Airfoil#33 will have a set angle of 1.4°. Starting with Airfoil#0 with a set angle of 8° and subtracting 33 reductions of 0.2° equals 1.4°. The finish twisted will will look like the image at above left. We now have the airfoil cross sections and we can use them to create the wing. I only model the skin in this article; not the internal structure called spars and ribs. Nor do I give the skin thickness. These can be modeled quite easily once the airfoils and skin have been modeled, and I will leave that exercise to the student. Recall that the beginning airfoil was constructed with a semi-circle, straight line and an arc. SketchUp models circles and curves with line segments. Each line segment has endpoints which the inference engine will point out when you hold your cursor over it. I connected these endpoints with straight lines to produce the mesh of rectangles shown in the picture above right. Again this is tedious and repetitive but doesn’t take too long. If wing twist is modeled the above process gets even more tedious. With wing twist no four points will form a plane – the wings twist ensures that. So the skin must be modeled with triangles; three points will always form a plane. 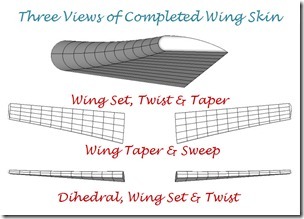 The image at left shows the hidden geometry of a twisted wing. Note that the wing tip is modeled using the Follow Me tool to create and one quarter sphere, then using the Push/Pull tool to extrude the one quarter sphere and finally using some hand stitching and cleanup. Swept wings should not be confused with tapered wings described above. Wings are swept – angled toward the tail – on high performance planes including corporate and airliner planes. The reason is simple; swept wings allow a plane to fly faster. How a swept wing works is not simple and in-depth understanding requires a degree in aeronautical engineering. I will attempt a significantly oversimplified explanation to give you some basic understanding. As a plane approaches the speed of sound, Mach 1, there is a speed lower than Mach 1 where, due to the complex shape of an airplane, some parts of the plane reach Mach 1. That is some areas of the plane reach Mach 1 before the plane’s airspeed is Mach 1. Shock waves appear at those points and produce drag rather abruptly and increases rapidly. These shock waves limit the speed the plane can fly. The critical Mach number (Mcr) of an aircraft is the lowest Mach number at which the airflow over some point of the aircraft reaches the speed of sound. This might be a number such as Mach 0.75. To increase the speed of the aircraft the aeronautical engineer has to increase the effective Mcr. Enter the swept wing. The Mcr of a non-swept wing is a function of the airfoil design; principally the chord line of the airfoil cross section. Before a wing is swept the chord line is parallel to the travel of the airplane and aligned with the planes airspeed. When the wing is swept the chord line is at an angle to the airspeed. The airspeed now aligned with the cord line is a fraction of the airplanes airspeed, and is proportional to a leg of the right triangle of which the chord line is the hypotenuse and the angle between the hypotenuse and leg is the sweep angle. Now the airplane can accelerate to a higher airspeed before the airspeed component parallel to the airfoil chord reaches Mcr. As stated earlier, this is significantly oversimplified. Not all of the theoretical advantage of sweeping a wing is realized because of other effects such as skin friction and fuselage drag. In fact some supersonic aircraft do not use swept wings, such as the Lockheed F-104 Starfighter which reaches airspeeds of Mach 1.7 with straight wings. Modeling wing sweep is a simple matter of using the Rotate tool to rotate the wing around a pivot point near or at the root. This angle is usually small but can be aggressive and deep on high performance military aircraft. Another very important design property is dihedral. Some plane wings slant up at the tip (dihedral) and some slant down (anhedral). 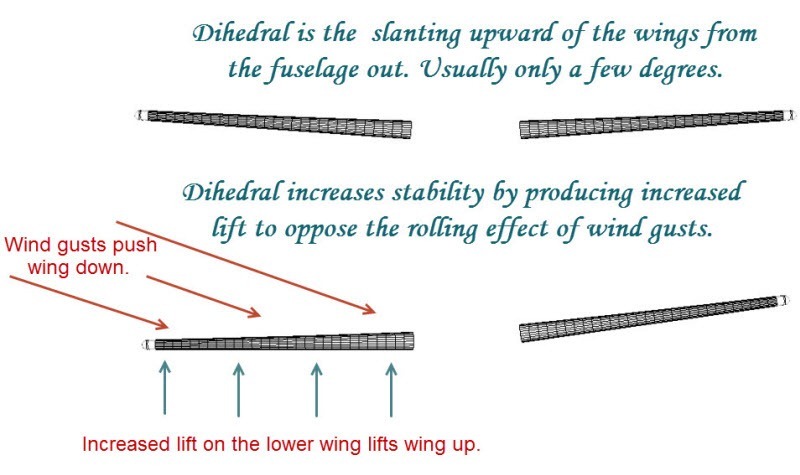 When dihedral is designed into a plane wing it increases roll stability (stability around the longitudinal axis). Cross wind gusts tend to push one wing down (or the other up). When this happens the lower wing has a greater attack angle and presents more surface area in the direction opposite gravity. This cause the lower wing to produce more lift which opposes the rolling effect of the wind gusts. 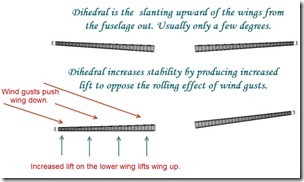 Dihedral is often used on small general aviation aircraft because this built in stability is rather inexpensive and tends to keep the inexperienced private pilot out of trouble. Anhedral is sometimes used on high performance planes for other advantages, but it is less stable. However, high performance aircraft have expensive and extensive computer sensors that can detect wind gust roll and generate computer controlled responses that can increase stability. Modeling dihedral, like sweep, is a simple matter of using the Rotate tool to rotate the wings up around a pivot point near or at the root. The angle is usually small, maybe 5° or so. 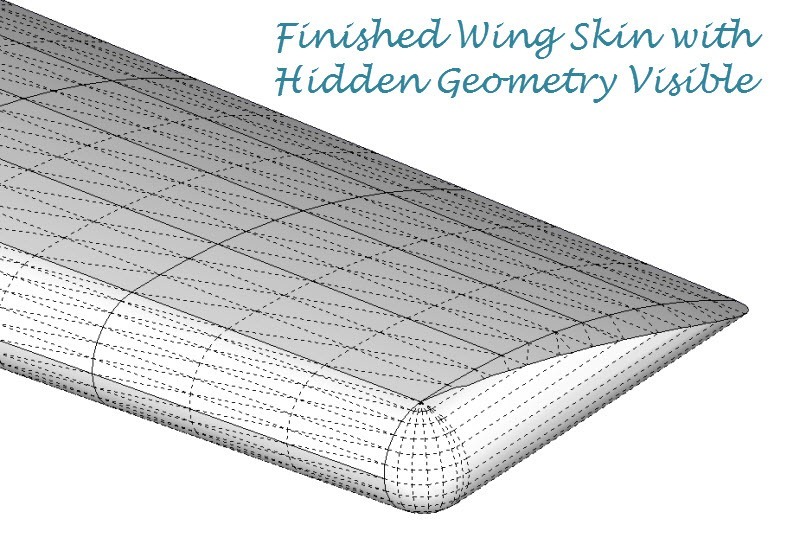 After modeling all the major attributes of a wing skin I ended up with the image at right. I used the Eraser tool with the Ctrl key to hide most of the lines including diagonals. The remaining lines simulate the edges of the aluminum sheets a wing skin is made of. If I were an aeronautical engineer designing a real wing I would use this skin to model the spars, ribs, aluminum sheet thickness, rivets, ailerons, flaps, fuel tanks, wing tip lighting and so on. My purpose here was to point out the type of modeling techniques one might use to model a fairly complex shape. This modeling task included a fair number of tedious and repetitive steps that would benefit from a Ruby script to produce Macro capability (memorize a sequence of steps and repeat them 1 to N times). Writing such a Ruby script would take much longer than executing the tedious modeling, and I doubt I would find the tool useful in many of the models I tend to work on. So overall it would be a waste of time. Modeling is often like that; it often pays to do things the simple and tedious way.